In 2011 the then-president of the Maldives, Mohamed Nasheed, held a televised cabinet meeting underwater. 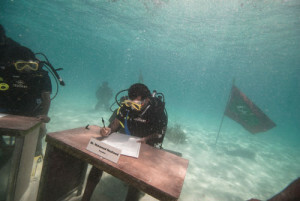 Armed with oxygen tanks and waterproof pens, ministers signed a document calling on countries to slash their carbon emissions. Nasheed also pledged to make the Maldives fossil fuel-free by 2020, and announced his intent to buy land in neighbouring India or Sri Lanka so that Maldivians could repatriate rather than become climate refugees. Nasheed’s motives were clear. The Maldives’ archipelago looks like paradise defined – sand-laced islands sprinkle the Indian Ocean like a starry sky of azure blue. But its peace is precarious. Comprised of nearly 1,200 low-lying islands, it has no in-built life raft to the rising waters and fierce, frequent storms that global warming portends. When the 2004 tsunami hit the Maldives its waves were barely a metre high. One hundred people died and 11,000 were displaced. Maldivians have not been relocated. Instead they are left with the task of transforming their country into a fortress – building dykes, reinforcing coastlines and safeguarding natural coral reef defences, all the while forging the transition to a low-carbon lifestyle. This won’t come cheap. In 2010 government estimates suggested that that US$279.5 million would be needed for climate change adaptation by 2020. Climate money is a dove of hope to those whose skies and seas are turning against them. The trouble is that in many cases it is entering countries and sectors characterised by risk. The last time the Maldives featured on Transparency International’s Corruption Perceptions Index – in 2011 – it scored 2.5 out of a possible 10, alongside Cameroon, and up one decimal place from Russia. Ninety-six per cent of Maldivians surveyed in our 2013 Global Corruption Barometer believed that their government was run by a few elites acting in their own interests. These statistics are brought to life through tales of cronyism and back-door dealing. In 2011, the Maldives’ Anti-Corruption Commission began investigations into a US$21 million public infrastructure project aimed at developing a stretch of coastline. A construction company had reportedly been hired to carry out the work without following the required procedures. The company in question was co-owned by Moosa Manik, chair of the country’s ruling party, meaning that, in the words of the Anti-Corruption Commission, the project would “illegally benefit a particular party”. Against this backdrop, Transparency Maldives has been investigating possible entry points for corruption in the climate sector. 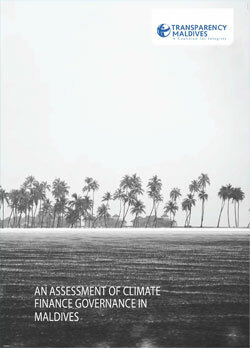 Their new report, An Assessment of Climate Finance Governance, articulates a number of concerns. For a start, government information on climate projects, their budgets and progress can be hard to come by in the Maldives. Accessibility is improving, but it will often involve official written requests, persistent phone calls and visits to ministries. This creates a situation of stark information asymmetry. In the capital Malé, citizens with time, resources or friends in high places may acquire information. Further afield, communities whose water supply is being desalinated will likely be clueless about what to expect from the project or how much it’s worth. Anyone tenacious or privileged enough to access government data will then face the unenviable task of making sense of it. Information made available was often out of date or inconsistent – the names of projects changed from year to year in the national budget, as had financial data. Frustratingly, different ministries have their own systems for reporting and disclosure, resulting in very divergent accounts of how much climate money is being spent where. As for where climate funds end up, some Maldivians have questioned why certain islands have been favoured over others. In the absence of clear criteria for project selection, it could be that a decision-maker is guided by personal or political concerns rather than factors such as population size or climate vulnerability. Discretionary decision-making is a problem further downstream, too. Implementing agencies in the Maldives tend to appraise their own projects rather than reporting to a central monitoring body, meaning that they are effectively their own auditor, police and judge. Transparency Maldives’ report isn’t entirely damning. In some respects the Maldives emerges as a standard-setter when compared to other countries – in its attempt to maintain a centralised database on all national development projects, for instance. Systems like this should be promoted, in the Maldives and elsewhere. Other mechanisms merit attention of a different kind – be that extra staff, increased information disclosure, third-party monitoring or more rigorous procedures for consulting the public on their needs and ideas for climate development. The prospect of a stormy sea is significant when you live 1.5 metres above sea level, and the furthest from the coast you could possibly be is three kilometres. Both are true of Maldivians. A country that is bracing itself for disaster needs to know that the dykes will hold when the storm surge bears down upon them. It cannot afford for bribery, nepotism or embezzlement that equates to shoddy workmanship, cheap materials or phantom projects. Our chapter’s research will, we hope, act as a prophylactic to such eventualities. Tackled now, systemic or institutional shortcomings might be shored up before the Maldivian cabinet has no choice but to meet underwater. Please note: The fourth paragraph was amended on 14 January 2014, to correct the number of displaced people from 1,100 to 11,000.